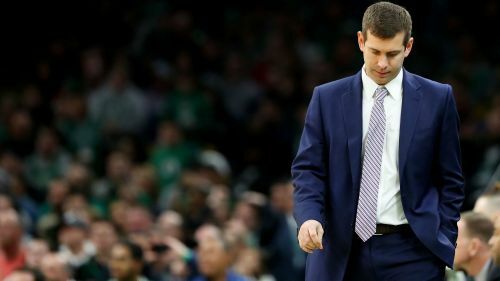 Brad Stevens was not happy with the Boston Celtics' defensive performance in their blowout loss to the Toronto Raptors. Eastern Conference high flyers the Raptors took a commanding lead before half-time and cruised to an easy 118-95 NBA win over the Celtics in Toronto. Celtics head coach Stevens addressed his team's poor play with reporters after Boston dropped to 37-24 on Tuesday. "Same old, same old," Stevens said. "I thought we were all over the place defensively tonight. … We're taking too many shortcuts [defensively]." The Celtics allowed Toronto to shoot 48.9 per cent from the field and 47.2 per cent from three-point range. They are now on a three-game losing streak and have dropped five of their last seven. Celtics star Kyrie Irving, however, might not see it that way. "I don't know," Irving said when asked how to fix the team's defense. "It's up to Brad [Stevens]." Irving had just seven points on three-of-10 shooting from the field. He hit one of his three three-point attempts. The Celtics will host the Portland Trail Blazers on Wednesday.